1. Take Time Out: It feels impossible to think straight and clearly when you're flooded with anxiety and fear. A racing heart, sweating palms, feeling panicky and confused are the result of adrenalin. The first thing to do is to take time out for yourself so you can physically calm down. 2. Expose Yourself To The Fear: Avoiding fears can only make them scarier. If you panic when you are in an elevator, it's best to get back into a lift the very next day. Stand in the elevator; don't be afraid to feel the fear until it fades away. Remember whatever your fear is, if you face it, it should start to fade. 3. Welcome The Worst: Every time fears are embraced, it makes it easier to cope with them the next time they strike. Try imagining the worst possible thing that can happen- perhaps it's panicking and having a heart attack. Then you need to try and think yourself into having one. It's just not possible, right? The fear will go away the more you chase it. 4. Don't Expect Perfection: Life is full of stresses, yet many of us keep hoping for a life that is perfect. Bad days and setbacks will always happen and it's essential to remember that life is messy. It's about the way you deal with them that matters the most. 5. Visualise: Take a moment and close your eyes. Imagine a calm place and a place where you feel secured; it could be a picture of you walking on a beautiful beach, or probably snuggled up in bed with your pet next to you or even a happy memory from your childhood. Let these positive feelings soothe you until you feel more relaxed. 6. Talk About It: Sharing fears takes away a lot of scariness that you might be feeling. Talk to your loved ones. 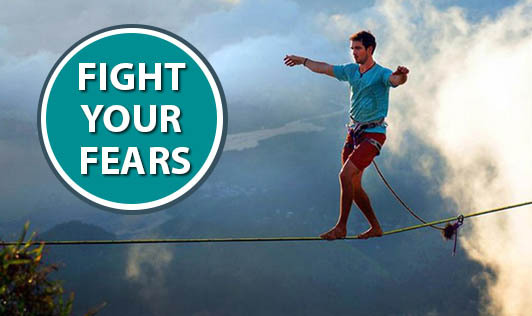 If your fears aren't going away, ask your physician for help. 7. Go Back to the Basics: A healthy meal, good sleep and a walk are often the best cures for anxiety. 8. Reward Yourself: Lastly, give yourself a treat. When you have picked up that insect or made that call you were dreading, reinforce your success by treating yourself - a massage, a meal out or whatever little gift that makes you happy!